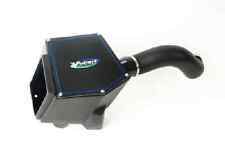 Plastic Black Cold Air Intake System with Pro 5 Filter (15553) by Volant®. System Type: Cold Air Intakes. Backed by a one-year warranty. Easy to install. High Performance Silicone connectors. Works with OEM computer system. 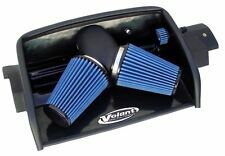 Plastic Black Cold Air Intake System with Pro 5 Filter (16157) by Volant®. System Type: Cold Air Intakes. Works with OEM computer system. Made in USA. Backed by a one-year warranty. Easy to install. High Performance Silicone connectors. "Volant Cold Air Intake --. VOLANT POWERCORE COLD AIR INTAKES. Series : Volant Powercore. Type : Sealed Intake. Air filter material : Synthetic. Air filter type : Dry. Condition : New. Dry filter designed with PowerCore Ultra-Web Filtration Technology for optimum filtration and no maintenance (up to 150K miles). Volant Pro-5 cold air intakes feature a unique oiled cotton gauze reusable air filter that’s engineered to maximize cold airflow and provide unmatched filtration, earning it a place on the most wanted parts lists of car, truck and SUV fanatics everywhere. Trending at $288.00eBay determines this price through a machine learned model of the product's sale prices within the last 90 days. Trending at $271.99eBay determines this price through a machine learned model of the product's sale prices within the last 90 days. If you want to further increase your Volant CAI kit effectiveness, add on the Volant Cool Air Scoop. Manufacturer: Volant| Manufacturers Part Number (MPN): 36457. 1500 Big Horn 5.7L 2014, 2015, 2016 2500 Laramie Longhorn 5.7L 2013, 2014, 2015, 2016. Volant Air Duct: Factory air inlet ducts use sound baffles and awkward bends which restrict flow. Our Cross-Link polyethylene air ducts are sculptured to give the engine less restrictive breathing. 2015-2018 GMC Yukon Yukon 5.3L V8. Trending at $270.01eBay determines this price through a machine learned model of the product's sale prices within the last 90 days.